Janey Larkin's migrant family doesn't have much. They live in a shack that belongs to someone else, and they move from place to place as opportunities for work arise and disappear. Janey has never attended a real school, and she doesn't have any friends. What she does have, though, is a blue willow plate. The last remaining reminder of her late biological mother, the plate represents for Janey a sense of normalcy and stability. Someday, her stepmother promises, they will have a proper home in which to display the plate. Janey thinks she may have found that perfect place, but does she dare believe that this time her family might stay? 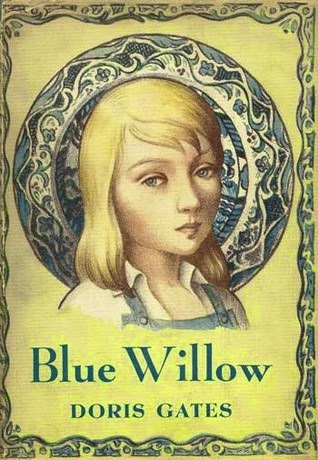 Published in 1940 and set in the 1930s, Blue Willow is a story about the difficulties faced by many people during the years of the Great Depression. Through the character of Janey, young readers are given a very personal glimpse into the experience of a poor migrant family which helps drive home the hardships real people were up against during that time. Janey's desires to be normal, to fit in, and to feel secure and stable are relevant to every child, regardless of time period, a fact which helps the story continue to hold up 65 years later. The writing in this book is not difficult to read, but it is filled with evocative images that bring the story to life. Particularly memorable are the moment where Janey first discovers the home of the man who owns her family's shack, and the visit to the fair, where Janey encounters her very first library. This is one of the only children's books I've read where a child's love for the library feels authentic. Janey's poverty makes her truly appreciate the notion of free access to books in a way that can't be read as anything but sincere. At the start, this book seems like just another depressing historical fiction story, but it turns out to be something much different, and the ending does not take any of the tragic turns I might have expected when I first started reading. The way everything comes together might feel a little too easy to a jaded adult reader, but for a child, the hope presented by the story's resolution will be very pleasing and comforting. I wish I had a nicer copy of this for my library. Read this in 3rd grade, and have always liked it. Maybe I'll have to reread.